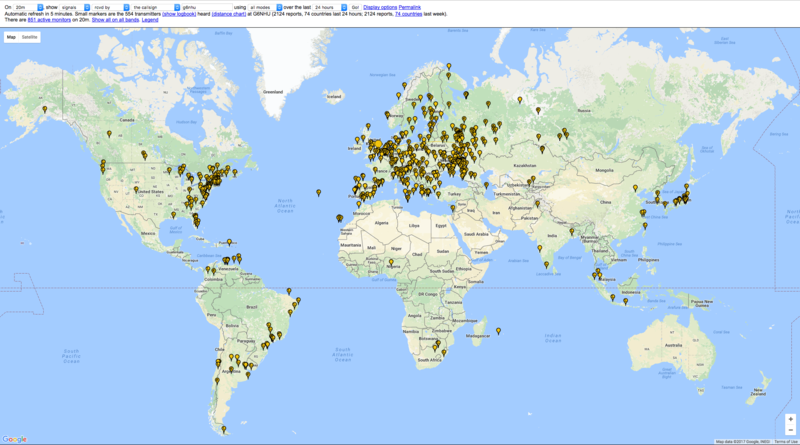 What can be achieved in twelve hours of 20m JT65/JT9? WSPR is great, I enjoy running WSPR and seeing how far I can transmit using very low power but there are a couple of drawbacks. I appreciate this will sound as though I’m knocking WSPR but trust me, I’m really not. Firstly, it’s not a QSO mode. I accept that many years ago, some QSOs were made using WSPR but that was in the very early stages of development and I don’t believe that the software is there to actually facilitate that any more. I find it frustrating to hear people say “Oh, I had contacts all over the world yesterday on WSPR”. No, you didn’t. You transmitted and someone received you, that doesn’t necessarily make a QSO. Secondly, although WSPR is incredibly good at penetrating around the world, just because someone in (say) VK land heard your 200mW WSPR signal with a strength of -28dB, that doesn’t mean the band is properly open and that you can complete a QSO using SSB or CW. You almost certainly can’t. This is where the low signal data modes come in, specifically JT65 and the newer JT9. I’ve written about JT65 a lot, I couldn’t have completed my original QSO365 without using JT65 and I discussed JT9 here. Rather than run WSPR for a day, I thought I’d spend twelve hours yesterday just receiving JT65 and JT9 signals on 20m. In theory, I should be able to work any station I can hear using these modes. I fired up the latest version of WSJT-X which includes JT4, JT9, JT65, QRA64, ISCAT, MSK144, and WSPR at just after 09:00z, configured it for JT65 and JT9 reception, switched it to 20m and let it sit there receiving and uploading everything to pskreporter to produce the map below. The results after twelve hours were quite astonishing. I know these modes are popular but I don’t think I realised quite how popular they’ve become. You can click the following two images for much larger versions. 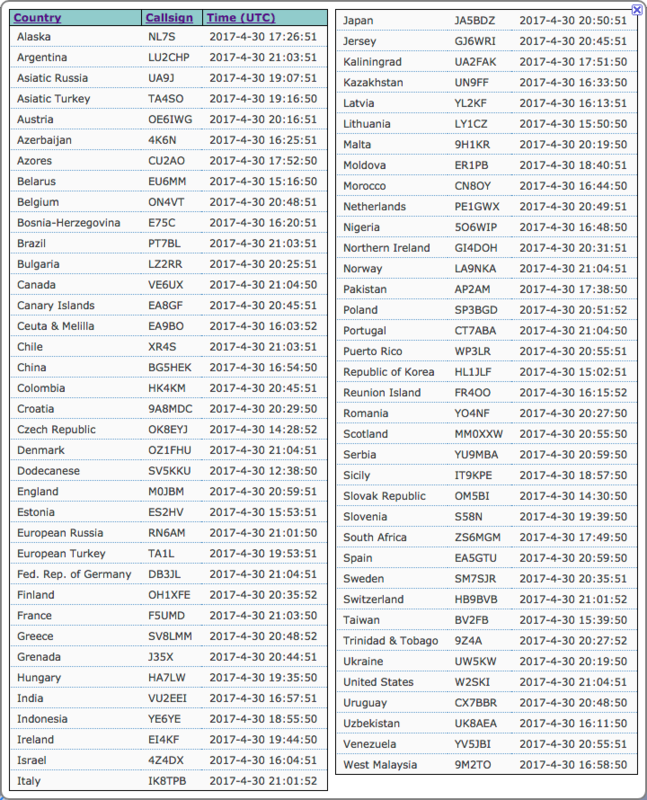 Over a period of twelve hours I received 2,124 individual transmissions from 554 unique transmitters spread over 74 countries. That’s quite incredible. To test my theory that all of these should be workable, I made four QSOs in the evening. I worked Venezuela, Japan, Puerto Rico and Brazil, all with JT65 and all using just five watts. I still like to run bucketloads of power when it’s appropriate but for these low signal modes, you really don’t need to run a lot of power to make contacts. The low power/low power data modes aren’t for everyone but they’re not difficult to use and are a great way of getting the most out of a small to medium sized station. They drag every dB of performance out of inefficient aerial systems and it’s no surprise that my first ever QSO with VK back in 2011 was using JT65 and a short ‘long’ wire aerial. If you’ve never tried these modes, I encourage you to give them a try. You’ll be happily surprised at what you can work. This entry was posted in Amateur radio, Data, HF, JT65, JT9, QSO365, WSPR and tagged JT65, JT65-HF, JT65A, JT9. Bookmark the permalink.